So, Darth Vader is renowned the world over as being the supreme commander of the Death Star, who instills fear and terror into everyone that he meets. But being so villanious has got to be hard work. 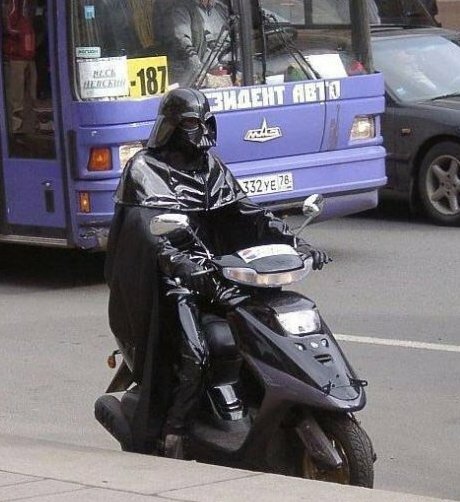 In between running the Death Star, oppressing the entire galaxy and relentlessly hunting down all the members of the Rebel Alliance, he must need some ‘down time’. Just, exactly, how does the Lord Vader unwind, you may be asking yourself. Well, I have the answer here, in never-before-seen photos of the Dark Lord, relaxing and getting in touch with his more humane side. Here is a picture of Vader, trying to make his way through heavy traffic on the way to a friend’s house, during a stop-over on Earth. 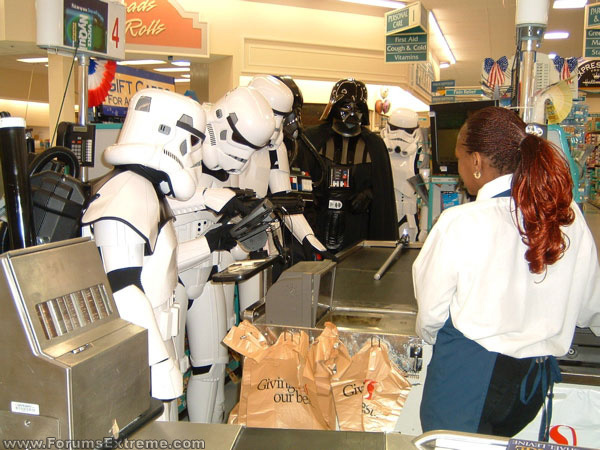 Here is Vader, shopping for provisions on the Death Star with some of his Stormtroopers. 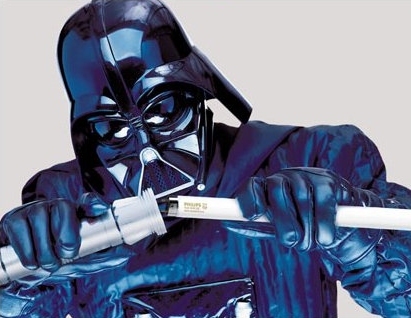 Here is a picture of the Dark Lord, trying to change the bulb on his light sabre. 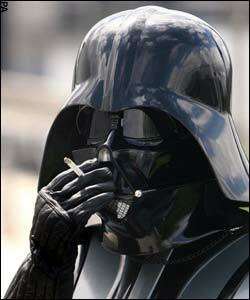 Here is Vader, having a smoke in between his heavy schedule of engagements. 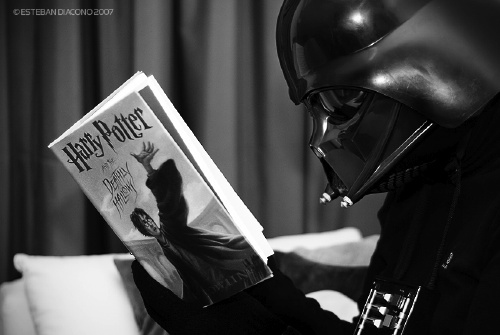 And, finally, here is the Lord Vader, unwinding with a good book (and keeping tabs on a potential threat) after a long, hard day on the Death Star. 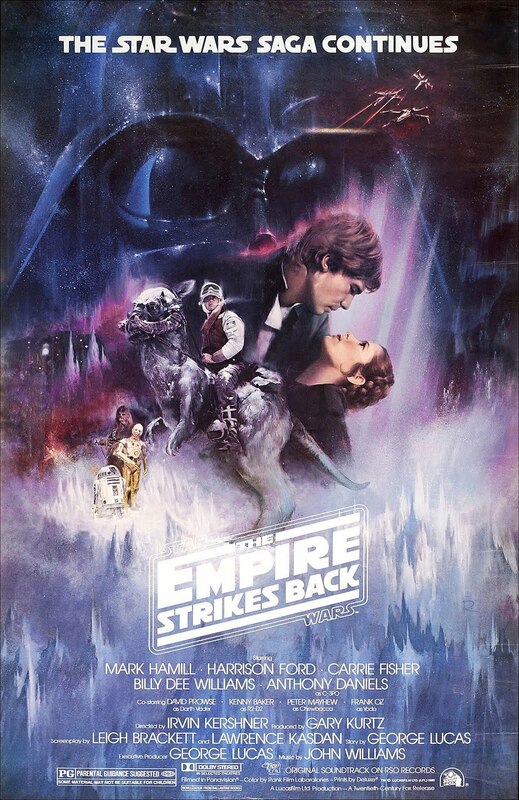 Today marks the 30th anniversary of the release of ‘The Empire Strikes Back’. The film was the fifth episode and the second installment in the Star Wars saga. Upon its intial release, the film received very mixed reviews from critics but, over the years, it has become many people’s favourite Star Wars film. It was also a pivotal film for creator, George Lucas. ‘Star Wars’ was released three years previously and became an unexpected success as well as a cultural phenomenon. Lucas wanted to use this success as a chance to become independent from the Hollywood film industry. He financed ‘The Empire Strikes Back’ by himself, bucking Hollywood trends, and took full control of the Star Wars enterprise. He brought in one of his former USC professors, Irvin Keshner, to direct and hired two leading screenplay writers to pen the story. This allowed Lucas to focus more on his company, Industrial Light And Magic (ILM), and the film’s special effects. The result was a technical achievement and an overwhelming triumph. The film cemented Lucas’ reputation and confirmed the Star Wars franchise as one of the most important cinematic and cultural achievements of the 20th century. And so, thirty years later, the film lives on in its many released, restored, remastered, re-released and limited editions. However, for me, the original is still the best. The movie reminds me of my youth and of the wide-eyed wonderment that I gazed at the screen with, as the characters and scenes unfolded before me. It created an entirely different existence that I, and every other ten-year old I knew, could get lost in and be fascinated by. It is, simply, one of the best films of all time.